Discover how to make the perfect chocolate souffle wrapped in little baklava pouches! 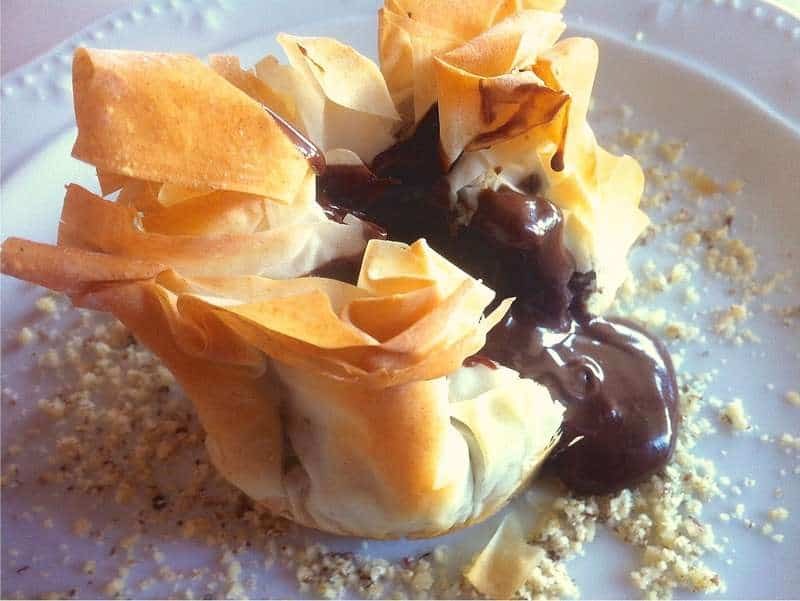 The most rich, melting chocolate filling, wrapped in golden brown crispy phyllo, layered with chopped nuts and sprinkled with melted butter, this is a completely different take on the traditional chocolate soufflé. If you ever thought that your classic baklava is missing some chocolate, or that your chocolate souffle, is missing something crunchy, then you have to try this impressive variation of the classic chocolate souffle, wrapped around a crispy baklava base! Try out this easy to follow step-by-step recipe and let everyone think you are a master chef. To prepare the chocolate filling, start by melting the chocolate. Chop the chocolate in small pieces and melt over low heat using a Bain Marie or double boiler, being careful not to burn it. In the meantime, add in a large bowl the sugar and the butter (40g) and whisk, using an electric mixer, until combined. Add the eggs, one at a time, whilst mixing, waiting for each one to be absorbed, before adding another. Add the vanilla extract and the flour and mix gently to combine. At the end pour in the bowl the melted chocolate and whisk, until the ingredients are combined. Set aside. Preheat the oven to 200C and melt the butter (60g) in microwave or on stovetop. Using a pastry brush, lightly brush bottoms and sides of a 10-hole muffin tin with butter; set aside and start preparing the chocolate- baklava pouches. Place 6 sheets of phyllo dough in a single stack. Using a sharp knife, cut the stack of dough into 6 rectangular pieces (cut three lanes and then cut in the middle). Use four rectangles of phyllo dough to make each pouch as follows: Working with one rectangle of phyllo at a time, brush one side with melted butter and sprinkle with the chopped nuts. Place a second piece of phyllo on top of the first one in a cross-wise manner, brush with melted butter, sprinkle with chopped almonds and walnuts. Repeat with the third and fourth piece, brushing with melted butter and topping with chopped nuts, forming an ‘eight-pointed’ star. Place the phyllo ‘star’ in a hole of the muffin tin, allowing the edges to fall out over the top of the hole. Fill with 2 tbsps of the chocolate mixture and pinch the sides of the phyllo dough together to close loosely the pouch. Repeat with the rest pouches. Place the muffin tin in the oven, turn the heat down to 180C and bake for 13 minutes, until the top turns golden. These baklava pouches are delicious on their own, but garnishing with just a little syrup, always gives a little something! So it’s up to you to decide! To prepare the syrup add 1 cup of sugar, 1 cup of water and a little lemon zest in a small pot and bring to the boil. Boil for about 5 minutes, until the sugar has dissolved and the syrup has slightly thickened. As soon as the baklava pouches are ready, drizzle the hot syrup over the pastry. Serve while still warm with a full-spoon of vanilla ice-cream. Enjoy! Same thing that happened to heyhey happened to me. Followed recipe to the tee, but filling was not gooey and melted, but closer to a solid. Perhaps cutting back on the forty grams of flour will help next time.